About two-thirds of U.S. residents live in areas where there is a moderate to very high risk of a natural disaster. While insuring your home and belongings won’t help you avoid disaster, it will help you recover from it. Here is what homeowners and renters need to know. All homeowners and renters should have adequate property insurance. Omitting certain types of coverage or having limited coverage that is too low to fully protect you could leave you with a financial loss you can’t recover from. Standard homeowners and renters insurance policies typically cover your personal belongings and the cost of being displaced (hotel bills, etc.) due to severe damage (as does the coverage for condominiums, townhomes and mobile homes). Homeowners insurance also covers the building. The coverage limit for a homeowner’s belongings is usually calculated as a percentage of the dwelling coverage. For example, if the building is insured for $400,000, the policy might pay for personal property damages up to 10 percent, or $40,000. Since renters insurance doesn’t cover the dwelling, the coverage limit for personal belongings should be the cost of replacing your belongings. Both homeowners and renters can add coverage (at a cost) to protect valuables that normally wouldn’t be covered, such as expensive electronics, jewelry, artwork, etc. Replacement cost coverage pays the actual cost of replacing your possessions, while actual cash value coverage only pays the depreciated cost of the item at the time of the loss. Replacement cost coverage is more expensive than actual cash value coverage, but the small additional premium is well worth it. Standard homeowners dwelling coverage kicks in after loss caused by a wide range of disasters, typically including tornadoes, wildfires, severe winds, hail and lightning. But "covered perils" vary, so you need to understand what exclusions (non-covered losses) your particular policy contains (https://www.iii.org/article/which-disasters-are-covered-by-homeowners-insurance). Typically excluded from a standard policy is damage caused by flood, earthquake, landslide/mudslide and sinkhole. And while, for example, wind damage might be covered under your policy, the deductible for wind damage caused by a hurricane might be higher, and flood damage that is the result of a hurricane might not be covered at all. Insurance coverage is complex; you must understand exactly what is and isn’t covered before a loss so that you are not uninsured or underinsured and can adjust or supplement coverage where necessary. An insurance professional, particularly one familiar with your current coverage, can help you determine the coverage you need to stay adequately protected and find ways to save money on premiums. When going over your policy, understand your deductibles—the amount of the loss that you would have to cover out of your own pocket. Lowering your deductible will increase your premiums; increasing your deductible will lower your premiums. You, not your insurance agent, determine the amount of your deductible, but the agent can help you understand how much your premium will change with any increase or decrease. An "insurance checkup" done annually or in response to significant changes is a good way to make sure your coverage and deductibles are right. Flood damage is excluded under standard homeowners and renters insurance policies. Separate flood insurance is available under the National Flood Insurance Program (NFIP) (888-379-9531). Some private insurers offer excess flood policies, which provide water damage protection over and above the coverage provided by the NFIP or a private flood policy. Learn more about flood insurance from the Insurance Information Institute (III). Note: Mortgage lenders typically require flood insurance on homes in flood zones. In other cases, it’s optional. Earthquake damage also is excluded under standard homeowners and renters insurance policies. Optional earthquake coverage is available from most insurance companies as a separate policy or an "endorsement" to your homeowners or renters policy. California homeowners can also purchase coverage through the non-profit California Earthquake Authority (CEA). Rates can vary widely, based on location, construction materials, foundation, height and more, and deductibles are higher (five to 15 percent of the policy limit) than those on standard homeowners or renters policies. Learn more about earthquake insurance from the III. If you live in a high-risk area for any particular type of disaster, talk to your insurer about the risks and how to protect against them. Confirm that your loss is covered under your policy. Ask about the claims process and timeline, including when the insurance claims adjuster will contact you and/or visit the property. If an adjuster has not contacted you to set up a visit within three days, call the insurance company back. In the meantime, take reasonable steps to protect your home from further damage, but don’t make any extensive or permanent repairs. Take photos or video of your losses, and create an inventory, including the approximate value of damaged property. Gather receipts for damaged items, if possible. Ideally, maintain an inventory of your property and store it in the "cloud" so that it is available if disaster strikes. There are many free home inventory apps, websites and software programs available. Ask your insurer if it has one, or search online for "home inventory." You should work with the adjuster to come to an agreement about the scope of damage and what needs to be repaired or replaced. If you disagree with the adjuster’s damage assessment and settlement offer, or if your claim is denied, ask your insurer to cite the specific part of your policy on which it has based its decision. If you still disagree, you can hire a commission-based "public adjuster" to work on your behalf to get a fair settlement, but experts advise exercising this option cautiously. Learn more about public adjusters from III. Learn how to navigate the claims process and resolve disputes in United Policyholders’ Claim Guidance Library. Be sure to keep detailed notes and copies of all communications with your insurer. If you can’t reach a resolution or feel that your insurer is acting in "bad faith," file a complaint with your state’s insurance commissioner. You might also consider hiring an attorney to inform you of your rights and advise you on how to proceed with your insurer, or to take over the fight for a fair settlement. Attorneys are expensive and not always necessary or the best option, so learn more before hiring one. If your personal insurance was not enough to cover all of your losses, or if you had no insurance, you might be eligible for help from the Federal Emergency Management Agency (FEMA) or other sources. FEMA disaster assistance includes grants to pay for temporary housing, emergency home repairs, uninsured and underinsured personal property losses, and disaster-related medical, dental and funeral expenses. 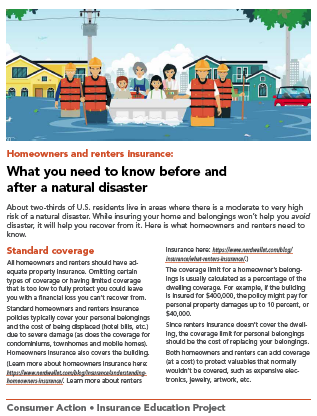 See our companion fact sheet, FEMA spells federal disaster relief for homeowners and renters, to learn more. Scam robocalls demanding immediate flood insurance premiums. If you suspect fraud related to a natural disaster, report it to the National Center for Disaster Fraud (866-720-5721 or [email protected]).